A year is very long time in digital audio. 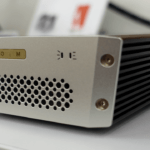 When Swiss company Merging Technologies – they of Pyramix studio consoles – launched the NADAC (“Network Attached DAC”) in early 2015, its Ethernet input and RAVENNA transmission protocol combo promised asynchronously networked digital audio. Buh-bye USB and S/PDIF. DAR caught up with the NADAC at the Munich audio show in May 2015. Get up to speed here. The NADAC comes in stereo and multi-channel variants which sell for US$10,500 and US$11,500 respectively. Back then, Merging Technologies were pretty much a field of one in the Ethernet DAC business. 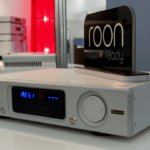 However – deep breath – in the intervening twelve months, Roon has gone from zero to hero and several DAC manufacturers have begun specifying Roon Ready streaming boards inside their decoders: PS Audio, Ayre Acoustics, AURALiC and (soon) Mytek Digital. Streaming DACs are now very much a thing and when paired with Roon’s own RAAT protocol they too offer asynchronous network streaming. In an attempt to stay one step ahead, Merging could be found at this year’s Munich event showing off a pre-production version of an optional internal PC board, complete with CPU and RAM, that will enable the NADAC to run Roon Core (server) via Microsoft Windows as well as operate as a Roon Ready (endpoint). No hard internal drives here though. Music supply for Roon Core comes via attached USB hard drives or a NAS. Just like an Intel NUC. Details on tech specs and pricing are sketchy right now with Merging’s Roon module set for official launch at RMAF in October. In other words, the NADAC won’t be Roon Ready (or Roon Cored) for another five months. As part of their Munich demo, Merging were also running a beta version of Roon, one capable of handling multi-channel audio. Beta means “not yet” (and probably “not soon”). Time enough to reset one’s internal expectation clocks accordingly but when it finally arrives, this souped up NADAC will be an option for those who want to run their Roon library and playback and D/A conversion from a single box. Just add iPad, amplification and loudspeakers.